A unique vessel, the MARSEA is a top notch sportfisher designed with comfort in mind. 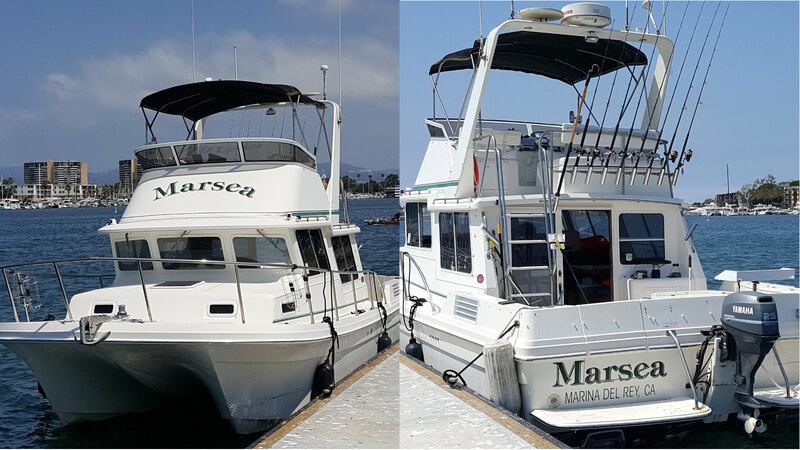 The MARSEA is a 32 foot SeaSport Pacific 3200 Catamaran Sportfisher. Built by SeaSport boats based in the Seattle area, the Pacific 3200 is the perfect all-weather vessel for the unpredictable Pacific Ocean. As of the last count, 30 of these models are currently running charters in Alaska! The MARSEA was built with your comfort in mind. It is equipped with both heat and air conditioning in the cabin. The MARSEA has a full head that even has a hot-water shower. 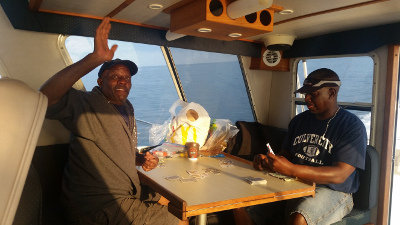 A full berth forward means you can relax on the ride to and from the fishing grounds. We’ve also got a single berth amidship that makes a great spot to lie down and rest your feet. The main cabin includes a table and seating for four on extremely comfortable cushions. Perfect for enjoying a meal or even a card game. The upper deck has plenty of comfortable seating while enjoying the amazing views from up high. A great spot for spotting schools of fish, whales and dolphin. 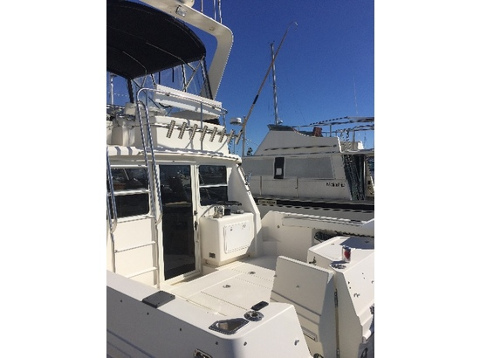 Our 13 foot beam means that the fishing cockpit is huge for a boat of this size and includes rail cushions for your comfort. Forward, the MARSEA has very sturdy 316L Stainless Steel railings for your safety while fishing the bow. 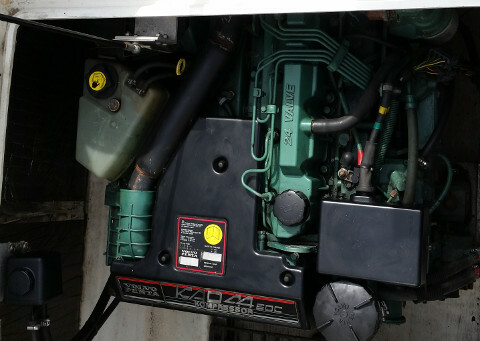 The MARSEA is powered by twin Volvo Penta KAD44 engines. Cruising speed is roughly 16-18 knots which means quick travel time to the fishing grounds. We have a fuel capacity of 300 gallons which gives us a tremendous range! 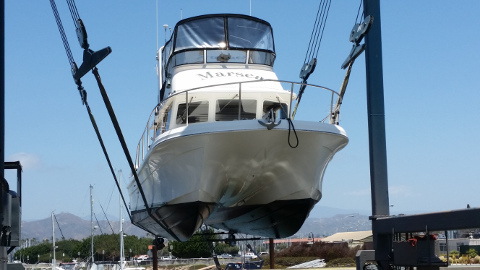 The MARSEA is a US Coast Guard certified UPV and is examined annually by the Coast Guard. We are permitted to take up to six paying passengers plus crew. The MARSEA has 8 adult Type I Personal Floatation Devices (PFD’s) and 4 child sized Type I PFD’s. All PFD’s have reflective tape and a personal light. 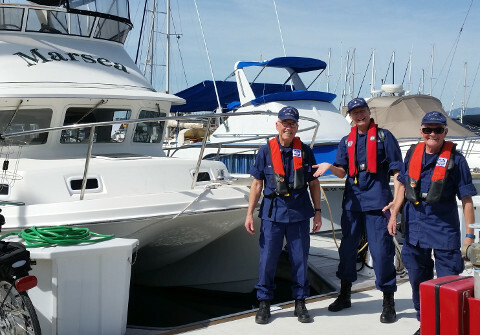 We have a VHF radio on board, Radar, GPS, a Commercial-Grade Life Ring and a Life Line. The unique design of the Pacific 3200 is unparalleled. The following is taken directly from SeaSport’s website: The Pacific 3200 catamaran is a uniquely designed boat with unparalleled performance. The twin asymmetrical hulls create a high speed, stable, and efficient ride not found in other boats this size. The patented catamaran design greatly reduces side rolls and pitching from wave action. The planing hulls allow you to cruise at 20 knots, even when the weather turns bad. Reduced drag results in better fuel efficiency, allowing you to go further on a tank of fuel. 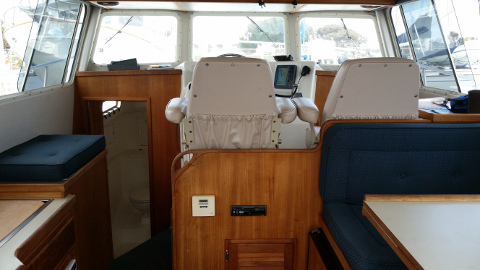 the interior has all the features needed for extended cruising and with four different layouts available, you can customize the boat to fit all your needs. All of this, along with the respected SeaSport name and matchless reputation, gives you the finest built, best handling cruising catamaran in it’s class.